The detection, flux determination and spectral modeling of Fermi LAT sources is accomplished by' a maximum likelihood optimization technique, as described in the Cicerone (see also, e.g., Abdo, A. A. et al. 2009, ApJS, 183, 46). To illustrate how to use the Likelihood software, this narrative gives a step-by-step description for performing a binned likelihood analysis. Binned likelihood analysis is the preferred method for most types of LAT analysis (see Cicerone). However, when analyzing data over short time periods (with few events), it is better to use the unbinned analysis. To perform an unbinned likelihood analysis see the Unbinned Likelihood tutorial. You will need an event data file, a spacecraft data file (also referred to as the ''pointing and livetime history" file), and the current background models (available for download). You may choose to select your own data files, or to use the files provided within this tutorial. Custom data sets may be retrieved from the Lat Data Server. Make Subselections from the Event Data: Since there is computational overhead for each event associated with each diffuse component, it is useful to filter out any events that are not within the extraction region used for the analysis. Make Counts Maps from the Event Files: By making simple FITS images we can inspect our data and pick out obvious sources. Download the latest diffuse models: The recommended models for a normal point source analysis are gll_iem_v07.fits (a very large file) and iso_P8R3_SOURCE_V2_v1.txt. All of the background models along with a description of the models are available here. Create a Source Model XML File: The source model XML file contains the various sources and their model parameters to be fit using the gtlike tool. Create a 3D Counts Cube: The binned counts cube is used to reduce computation requirements in regions with large numbers of events. Compute Livetimes: Precomputing the livetime for the dataset speeds up the exposure calculation. Compute Exposure Cube: This accounts for exposure as a function of energy, based on the cuts made. The exposure map must be recomputed if any change is made to the data selection or binning. Compute Source Maps:Here the exposure calculation is applied to each of the sources described in the model. Perform the Likelihood Fit: Fitting the data to the model provides flux, errors, spectral indices, and other information. Create a Model Map: This can be compared to the counts map to verify the quality of the fit and to make a residual map. For this case we will use two years of LAT Pass 8 data. This is a longer data set than is described in the Extract LAT Data tutorial. NOTE: The ROI used by the binned likelihood analysis is defined by the 3D counts map boundary. The region selection used in the data extraction step, which is conical, must fully contain the 3D counts map spatial boundary, which is square. When analyzing point sources, it is recommended that you include events with high probability of being photons. To do this, you should use gtselect to cut on the event class, keeping only the SOURCE class events (event class 128, or as recommended in the Cicerone). In addition, since we do not wish to cut on any of the three event types (conversion type, PSF, or EDISP), we will use evtype=3 (which corresponds to standard analysis in Pass 7). Note that "INDEF" is the default for evtype in gtselect. Be aware that evclass and evtype are hidden parameters. So to use them, you must type them on the command line. The text file you made (binned_events.txt) will be used in place of the input fits filename when running gtselect. The syntax requires that you use an @ before the filename to indicate that this is a text file input rather than a fits file. We perform a selection to the data we want to analyze. For this example, we consider the source class photons within our 15 degree region of interest (ROI) centered on the blazar 3C 279. For some of the selections that we made with the data server and don't want to modify, we can use "INDEF" to instruct the tool to read those values from the data file header. Here, we are only filtering on event class (not on event type) and applying a zenith cut, so many of the parameters are designated as "INDEF". In the last step we also selected the energy range and the maximum zenith angle value (90 degrees) as suggested in Cicerone and recommended by the LAT instrument team. The Earth's limb is a strong source of background gamma rays and we can filter them out with a zenith-angle cut. The use of "zmax" in calculating the exposure allows for a more selective method than just using the ROI cuts in controlling the Earth limb contamination. The filtered data are provided here. This excludes time periods when some spacecraft event has affected the quality of the data, ensures the LAT instrument was in normal science data-taking mode. Here is an example of running gtmktime for our analysis of the region surrounding 3C 279. The data file with all the cuts described above is provided in this link. A more detailed discussion of data selection can be found in the Data Preparation analysis thread. Here you can see the event class and event type, the location and radius of the data selection, as well as the energy range in MeV, the zenith angle cut, and the fact that the time cuts to be used in the exposure calculation are defined by the GTI table. Various Fermitools will be unable to run if you have multiple copies of a particular DSS keyword. This can happen if the position used in extracting the data from the data server is different than the position used with gtselect. It is wise to review the keywords for duplicates before proceeding. If you do have keyword duplication, it is advisable to regenerate the data file with consistent cuts. gtbin: WARNING: No spacecraft file: EXPOSURE keyword will be set equal to ontime. We chose an ROI of 15 degrees, corresponding to 30 degrees in diameter. Since we want a pixel size of 0.2 degrees/pixel, then we must select 30/0.2=150 pixels for the size of the x and y axes. The last command launches the visualization tool ds9 and produces a display of the generated counts map. Since the counts map shows the expected data, you are ready to prepare your data set for analysis. For binned likelihood analysis, the data input is a three-dimensional counts map with an energy axis, called a counts cube. The gtbin tool performs this task as well, by using the CCUBE option. The binning of the counts map determines the binning of the exposure calculation. The likelihood analysis may lose accuracy if the energy bins are not sufficiently narrow to accommodate more rapid variations in the effective area with decreasing energy below a few hundred MeV. For a typical analysis, ten logarithmically spaced bins per decade in energy are recommended. The analysis is less sensitive to the spatial binning and 0.2 deg bins are a reasonable standard. This counts cube is a square binned region that must fit within the circular acceptance cone defined during the data extraction step, and visible in the counts map above. To find the maximum size of the region your data will support, find the side of a square that can be fully inscribed within your circular acceptance region (multiply the radius of the acceptance cone by sqrt(2)). For this example, the maximum length for a side is 21.21 degrees. The counts cube generated in this step is provided here. If you open the file with ds9, you see that it is made up of 37 images, one for each logarithmic energy bin. 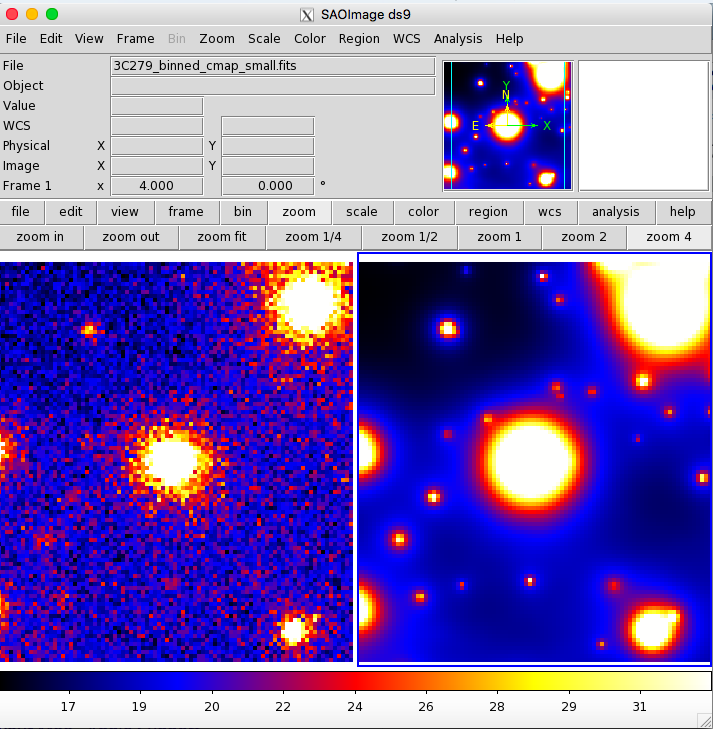 By playing through these images, it is easy to see how the PSF of the LAT changes with energy. You can also see that changing energy cuts could be helpful when trying to optimize the localization or spectral information for specific sources. Be sure to verify that there are no black corners on your counts cube. These corners correspond to regions with no data, and will cause errors in your exposure calculations. When you use the current Galactic diffuse emission model (gll_iem_v07.fits) in a likelihood analysis, you also want to use the corresponding model for the extragalactic isotropic diffuse emission, which includes the residual cosmic-ray background. The recommended isotropic model for point source analysis is iso_P8R3_SOURCE_V2_v1.txt. All the Pass 8 background models have been included in the Fermitools distribution, in the $(FERMI_DIR)/refdata/fermi/galdiffuse/ directory. If you use that path in your model, you should not have to download the diffuse models individually. NOTE: Keep in mind that the isotropic model needs to agree with both the event class and event type selections you are using in your analysis. The iso_P8R3_SOURCE_V2_v1.txt isotropic spectrum is valid only for the latest response functions and only for data sets with front + back events combined. All of the most up-to-date background models along with a description of the models are available here. The gtlike tool reads the source model from an XML file. The model file contains your best guess at the locations and spectral forms for the sources in your data. A source model can be created using the model editor tool, by using the user contributed tool make4FGLxml.py (available at the user-contributed tools page), or by editing the file directly within a text editor. Note that we are using a high level of significance so that we only fit the brightest sources and we have forced the extended sources to be modeled as point sources. It is also necessary to specify the entire path to location of the diffuse model on your system. Clearly, the simple 4-source model we used for the 6-month Unbinned Likelihood analysis would have been too simplistic. Finally, the make4FGLxml.py script automatically adds 10 degrees to your ROI to account for sources that lie outside your data region, but which may contribute photons to your data. In addition, it gives you the ability to free only some of the spectral parameters for sources within your ROI, and fixes them for the others. With hundreds of sources, there are too many free parameters to gain a good spectral fit. It is advisable to revise these values so that only sources near your source of interest, or very bright source, have all spectral parameters free. Farther away, you can fix the spectral form and free only the normalization parameter (or "prefactor"). If you are working in a crowded region, or have nested sources (e.g. a point source on top of an extended source), you will probably want to fix parameters for some sources even if they lie close to your source of interest. Only the normalization parameter will be left free for the remaining sources within the ROI. We have also used the significance parameter (-s) of make4FLGxml.py to free only the brightest sources in our ROI. In addition, we used the -v flag to override that for sources that are significantly variable. Both these changes are necessary: having too many free parameters will not allow the fit to converge (see the section for the fitting step). The XML file used in this example can be found here. In some regions, the make4FGLxml.py script may add one or more extended sources to your XML model. The script will provide the number of extended sources included in the model. In order to use these extended sources, you will need to downloaded the extended source templates from the LAT Catalog page (look for "Extended Source template archive"). Extract the archive in the directory of your choice and note the path to the template files, which have names like "W44.fits" and "VelaX.fits". You will need to provide the path to the template file to the script before you run it. To speed up the exposure calculations performed by Likelihood, it is helpful to pre-compute the livetime as a function of sky position and off-axis angle. The gtltcube tool creates a livetime cube, which is a HealPix table, covering the entire sky, of the integrated livetime as a function of inclination with respect to the LAT z-axis. Note: Values such as "0.1" for "Step size in cos(theta)" are known to give unexpected results. Use "0.09" instead. The livetime cube generated for this analysis can be found here. For more information about the livetime cubes see the documentation in the Cicerone, and also the explanation in the Unbinned Likelihood tutorial. Next you must apply the livetime calculated in the previous step to your region of interest. To do this, we use the gtexpcube2 tool, which is an updated version of the previous gtexpcube. This tool generates a binned exposure map, an accounting of the exposure at each position in the sky, that are a required input to the likelihood process. NOTE: In the past, running gtsrcmaps calculated the exposure map for you, so most analyses skipped the binned exposure map generation step. With the introduction of gtexpcube2, this is no longer the case. You must explicitly command the creation of the exposure map as a separate analysis step. In order to create an exposure map that accounts for contributions from all the sources in your analysis region, you must consider not just the sources included in the counts cube. The large PSF of the LAT means that at low energies, sources from well outside your counts cube could affect the sources you are analyzing. To compensate for this, you must create an exposure map that includes sources up to 10 degrees outside your ROI. (The ROI is determined by the radius you downloaded from the data server, here a 15 degree radius.) In addition, you should account for all the exposure that contributes to those additional sources. Since the exposure map uses square pixels, to match the binning in the counts cube, and to ensure we don't have errors, we generate a 300x300 pixel map. 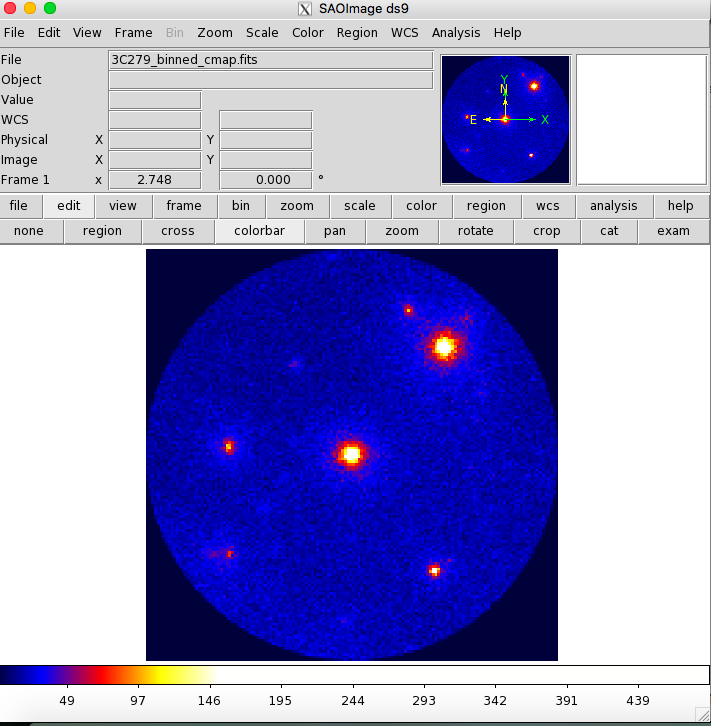 If you provide gtexpcube2 a filename for your counts cube, it will use the information from that file to define the geometry of the exposure map. This is legacy behavior and will not give you the necessary 20Â° buffer you need to completely account for the exposure of nearby sources. (It will also cause an error in the next step.) Instead, you should specify the appropriate geometry for the exposure map, remembering that the counts cube used 0.2 degree pixel binning. To do that, enter 'none' when asked for a Counts cube. Note: If you get a "File not found" error in the examples below, just put the IRF name in explicitly. The appropriate IRF for this data set is P8R3_SOURCE_V2. The generated exposure map can be found here. The all-sky exposure map can be found here. Just as in the Unbinned Likelihood analysis, the exposure needs to be recalculated if the ROI, zenith angle, time, event class, or energy selections applied to the data are changed. For the binned analysis, this also includes the spatial and energy binning of the 3D counts map (which affects the exposure map as well). The gtsrcmaps tool creates model counts maps for use with the binned likelihood analysis. To do this, it takes each source spectrum in the XML model, multiplies it by the exposure at the source position, and convolves that exposure with the effective PSF. Generating SourceMap for 4FGL J1118.2-0415....................! Generating SourceMap for 4FGL J1118.6-1235....................! Generating SourceMap for 4FGL J1119.9-0011....................! The output file from gtsrcmaps can be found here. Request for exposure at a sky position that is outside of the map boundaries. In this situation, you should increase the dimensions of your exposure map, or just move to the all-sky version. Source map generation for the point sources is fairly quick, and maps for many point sources may take up a lot of disk space. If you are analyzing a single long data set, it may be preferable to pre-compute only the source maps for the diffuse components at this stage. gtlike will compute maps for the point sources on the fly if they appear in the XML definition and a corresponding map is not in the source maps FITS file. To skip generating source maps for point sources, specify "ptsrc=no" on the command line when running gtsrcmaps. However, if you expect to perform multiple fits on the same set of data, precomputing the source maps will probably save you time. NOTE: Prior to running gtlike for Unbinned Likelihood, it is necessary to calculate the diffuse response for each event (when that response is not precomputed). However, for Binned Likelihood analysis the diffuse response is calculated over the entire bin, so this step is not necessary. Now we are ready to run the gtlike application. Here, we request that the fitted parameters be saved to an output XML model file for use in later steps. Most of the entries prompted for are fairly obvious. In addition to the various XML and FITS files, the user is prompted for a choice of IRFs, the type of statistic to use, and the optimizer. BINNED This is a standard binned analysis, described in this tutorial. This analysis is used for long timescale or high-density data (such as in the Galactic plane) which can cause memory errors in the unbinned analysis. If this option is chosen then parameters for the source map file, livetime file, and exposure file must be given. Since we selected 'plot=yes' in the command line, a plot of the fitted data appears. If you have more sources the colors are reused in the same order. In our case we have, in order of decreasing value on the y-axis: summed model (black), the extragalactic background (black), the galactic background (cyan), 3C 273 (red), and 3C 279 (black). The second plot gives the residuals between your model and the data. Error bars here represent (sqrt(Nopbs))/Npred, where Npred is the predicted number of counts in each band based on the fitted model. To assess the quality of the fit, look first for the words at the top of the output "<Optimizer> did successfully converge." Successful convergence is a minimum requirement for a good fit. Next, look at the energy ranges that are generating warnings of bad fits. If any of these ranges affect your source of interest, you may need to revise the source model and refit. You can also look at the residuals on the plot (bottom panel). If the residuals indicate a poor fit overall (e.g., the points trending all low or all high) you should consider changing your model file, perhaps by using a different source model definition, and refit the data. If the fits and spectral shapes are good, but could be improved, you may wish to simply update your model file to hold some of the spectral parameters fixed. For example, by fixing the spectral model for 3C 273, you may get a better quality fit for 3C 279. Close the plot and you will be asked if you wish to refit the data. Here, hitting 'return' will instruct the application to fit again. We are happy with the result, so we type 'n' and end the fit. When it completes, gtlike generates a standard output XML file. If you re-run the tool in the same directory, these files will be overwritten by default. Use the clobber=no option on the command line to keep from overwriting the output files. Unfortunately, the fit details and the value for the -log(likelihood) are not recorded in the automatic output files. You should consider logging the output to a text file for your records by using '> fit_data.txt' (or something similar) with your gtlike command. Be aware, however, that this will make it impossible to request a refit when the likelihood process completes. In this example, we used the 'sfile' parameter to request that the model results be written to an output XML file. This file contains the source model results that were written to results.dat at the completion of the fit. Note: If you have specified an output XML model file and you wish to modify your model while waiting at the 'Refit? [y]' prompt, you will need to copy the results of the output model file to your input model before making those modifications. Errors reported with each value in the results.dat file are 1Ïƒ estimates (based on inverse-Hessian at the optimum of the log-likelihood surface). If you are scripting and wish to generate multiple output files without overwriting, the 'results' and 'specfile' parameters allow you to specify output filenames for the results.dat and counts_spectra.fits files respectively. If you do not specify a source model output file with the 'sfile' parameter, then the input model file will be overwritten with the latest fit. This is convenient as it allows the user to edit that file while the application is waiting at the 'Refit? [y]' prompt so that parameters can be adjusted and set free or fixed. This would be similar to the use of the "newpar", "freeze", and "thaw" commands in XSPEC. For comparison to the counts map data, we create a model map of the region based on the fit parameters. This map is essentially an infinite-statistics counts map of the region-of-interest based on our model fit. The gtmodel application reads in the fitted model, applies the proper scaling to the source maps, and adds them together to get the final map. 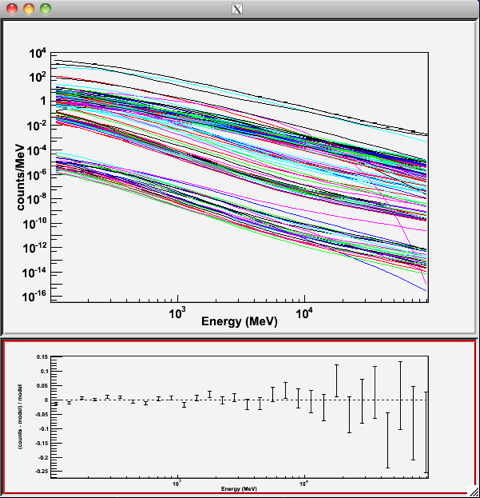 Here we've plotted the model map next to the the energy-summed counts map for the data. The residual map is shown below. As you can see, the binning we chose probably used pixels that were too large. 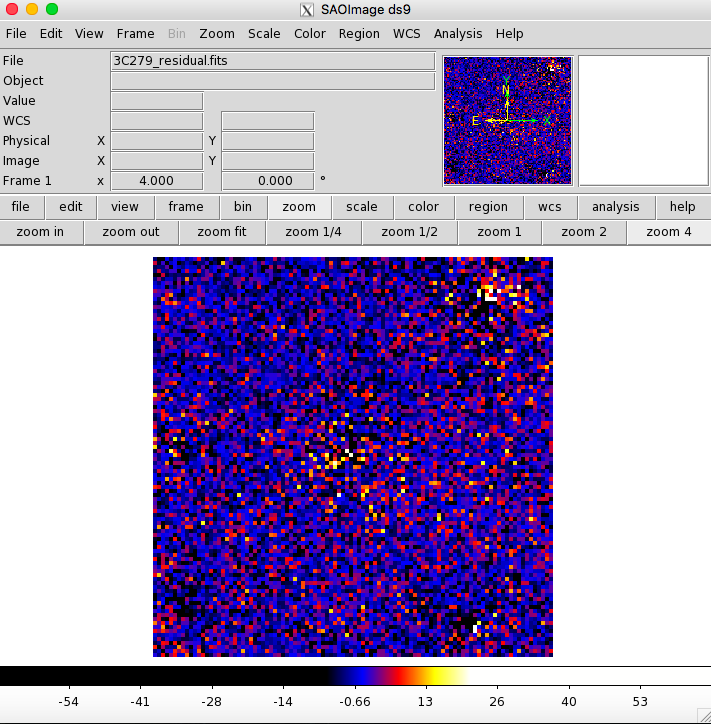 The primary sources, 3C 273 and 3C 279, have some positive pixels next to some negative ones. This effect could be lessened by either using a smaller pixel size or by offsetting the central position slightly from the position of the blazar (or both). If your residual map contains bright sources, the next step would be to iterate the analysis with the additional sources included in the XML model file.